The conflict in impoverished Yemen began with the 2014 takeover of the capital of Sanaa by Houthi Shiite rebels, which toppled the internationally recognized government. He said a coalition airstrike on Thursday killed at least 22 children and four women fleeing fighting in Al Durayhimi district in Hodeida governorate. An additional airstrike in Al Durayhimi on Thursday killed four children, he said. On August 9, coalition airstrikes hit a bus in a busy market in Saada governorate in Yemen’s north, killing at least 51 people including 40 children. The attack drew broad international condemnation and the coalition said it would investigate. The conflict in impoverished Yemen began with the 2014 takeover of the capital of Sanaa by Houthi Shiite rebels, which toppled the internationally recognized government. A Saudi-led coalition allied with the government has been fighting the Iranian-aligned Houthis since 2015. Civilians have borne the brunt of the conflict which has pushed Yemen to the brink of famine, crippled the country’s health system, and killed over 10,000 people. The Houthis had blamed Thursday’s attack in Hodeida on the coalition. But state media of the United Arab Emirates, a key coalition member, disputed the claim and said the rebels launched the attack, killing one child and injuring dozens. Neither side’s claims could be independently verified, but Lowcock’s statement put the blame on the coalition. 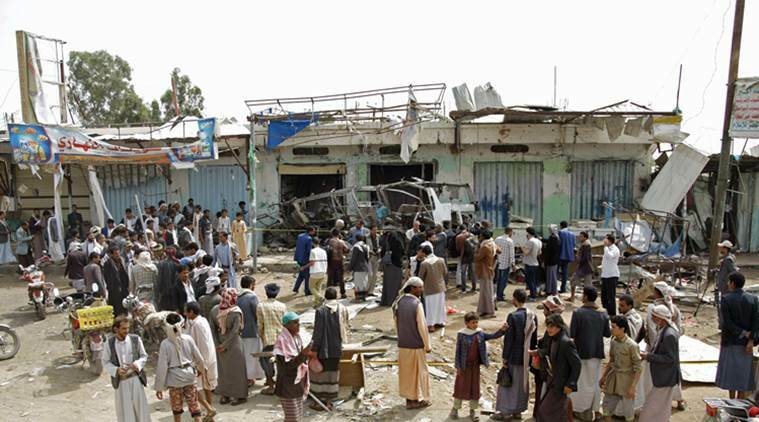 Lowcock’s condemnation of the recent coalition airstrikes follows the release earlier Friday of a 90-page report by Human Rights Watch accusing the Saudis and others of failing to conduct credible investigations into alleged war crimes committed in Yemen or redress the toll on civilians. He stressed that the humanitarian operation in Yemen is currently the largest in the world, with three-quarters of the population in need of aid. In 2018, he said, the UN and its partners assisted more than 8 million people. Lowcock expressed deep concern at the proximity of attacks to humanitarian sites including health facilities and water and sanitation operations. “The parties to the conflict must respect their obligations under international humanitarian law and those with influence over them must ensure that everything possible is done to protect civilians,” he said. Frank McManus, Yemen country director for the International Rescue Committee, a New York-based humanitarian organization working in over 40 countries, warned that attacks like those in Saada and Hodeida “will undermine the potential for progress” in peace negotiations in Geneva between the Houthis and government scheduled to start on Sept. 6.